If you want that extra bit of personalising for your hen party or birthday. Then browse our options for custom printed sashes. Of course we don't just produce these products for hen parties or birthdays. You can also use them for product promotion, prom nights, beauty contests, exhibitions etc. In fact anywhere where you want to draw attention to a message. We know that it is difficult to plan everything in time. The smaller items like party accessories are notorious for being forgotten about until the very last minute. We custom print the sashes in house. So we have total control over their production. Hence we are usually able to accommodate last minute orders. Even if you think it is a little too late then we would encourage you to give us a quick call. If you then select the guaranteed next day delivery option. We can often get the sashes delivered to you in less than 24 hours from the initial contact with us. We hold large stocks of our standard colour range of ribbon-. Most of which can be printed with black coloured text, which is our standard product. As an option we can also print with metallic silver and metallic gold foil. These foils give a particularly stunning appearance especially on the darker ribbon colours. For the lighter colours we can also print a range of coloured text, such as white, red, blue, green, brown. pink, burgundy. But for the best effect these colours are really best suited to white ribbon. When you choose the text for your customised sashes, you can have whatever text you want. But please bear in mind that the ribbon is only 100mm (4 inches) wide. And the horizontal space for the print is only about 50cm. So the more wording you have then the smaller it will have to be and the less legible it will be at a distance. Usually for something like one of our hen night personalised sashes with 'Lisa's Hen Night, Preston November 2014', we would print the 'Lisa's Hen Night' in slightly larger text. 'Preston 2014' would be underneath in slightly smaller text. Logos and simple images can be included at no extra cost. They do however need to be simple line drawings and can normally only be printed in the same colour as the main text. By default we print our customised sashes- hen night sashes and birthday sashes so that they can be worn over the wearer's right shoulder. If you require them for use over the other shoulder then please inform us when you order. Otherwise the text for the front will be on the back and the text for the back will be at the front. Our hen night sashes and birthday sashes are secured by pieces of self adhesive hook and look fastening which enables the sash to be positioned around the wearer and then finally adjusted before the fasteners are attached. This ensures a perfect fit for your hen night sash or birthday sash whether they are being worn on a dress or jacket or thicker outdoor wear. Our standard sashes are 6 feet (1.8M) in length. On request we can make them a little longer or shorter. This will ensure the best fit and optimum positioning of the text when they are worn. 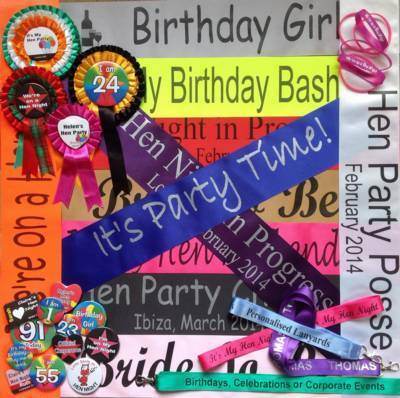 So whatever your printed ribbon or customised hen night personalised sashes requirements are. Whether it is for hen party sashes, hen night sashes, birthdays sashes, prom sashes. 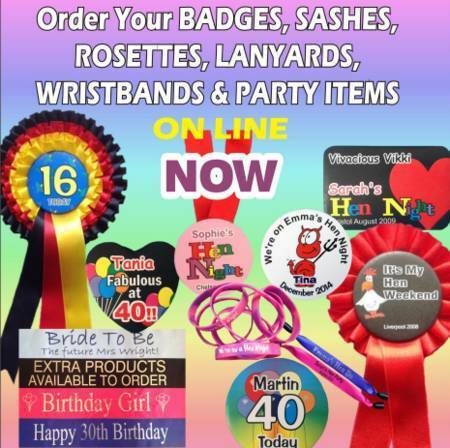 Then click on the link above and visit our on line order and get your personalised sashes now. If you cannot manage to order exactly what you require on line then you can always send us an email with your request. Or fill in our enquiry form. Then we will send you a quotation. And when you are ready to order we can send you a payment link.